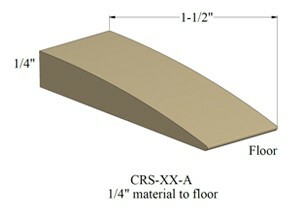 This 1 1/2 inch wide transition strip is a durable Johnsonite flooring reducer for 1/4 inch flooring to flush. The reducer's unmatched durability provides long-lasting safety in high traffic areas and wheel chair accessible spots. This flooring reducer uses high quality additives and colorants that meet the performance and design requirements of the ADA (Americans with Disabilities Act), ensuring a safer transition between floors of different height. For a gentle concrete to carpet transition which matches your decor, this 1 1/2" wide vinyl carpet reducer is a perfect fit. This product is available in Johnsonite's standard 27 Colors. Sold in 12 foot carpet reducer sections. Constructed with homoegeneous composition of polyvinyl chloride (PVC), high quality additives, and colorants. This carpet reducer may be glued down with transition adhesive. See the Transition Installation Video for help during the process of installing your carpet reducer. Please Note: Every monitor displays colors differently. The colors seen on this website may not accurately depict the colors of the carpet reducer. You can request Color & Transition Samples here. 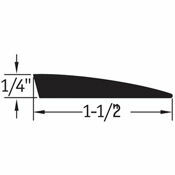 Select color and quantity of 12 foot carpet reducer sections below.